After studying to become a therapist and crisis intervention counselor—even doing her master’s thesis on the stages of bereavement—Christina Rasmussen thought she understood grief. But it wasn’t until losing her husband to cancer in her early 30s that she truly grasped the depths of sorrow and pain that accompany loss. Using the knowledge she gained while wading through her own grief and reading hundreds of neuroscience books, Rasmussen began to look at experiences in a new way. She realized that grief plunges you into a gap between worlds—the world before loss and the world after loss. She also realized how easy it is to become lost in this gap. In Second Firsts, Rasmussen walks you through her Life Reentry process to help you break grief’s spiral of pain, so you can stop simply surviving and begin to live again. She shows you that loss can actually be a powerful catalyst to creating a life that is in alignment with your true passions and values. The resilience, strength, and determination that have gotten you through this difficult time are the same characteristics that will help you craft your wonderful new life. Her method, which she has used successfully with thousands of clients, is based on the science of neuroplasticity and focuses on consciously releasing pain in ways that both honor suffering and rewire the brain to change your perception of the world and yourself. Using practical exercises and stories drawn from her own life and those of her clients, Rasmussen guides you through five stages of healing that help you open up to new possibilities. From acknowledging your fear, to recognizing where you stand now, to taking active steps toward a new life, Rasmussen helps you move past the pain and shows that it’s never too late to step out of the gap and experience life again—as if for the first time. "Second Firsts will change the way you think about life after loss. With simplicity, science, and raw authenticity, Christina takes you on a journey from a world of loneliness and pain to one of possibilities and action. Her kind and knowledgeable words provide hope and show you that loss can actually inspire the strength and conviction to create the life of your dreams. And her own life stands as a testament to the power of this process."
? "Second Firsts is about creating a bigger life after loss. It is about dreaming of a brand-new way to fall in love again with living fully. It is certainly not an easy task, but this little book makes it easier." "We can all learn from the wisdom of those who have experienced loss and survived. Second Firsts can be your life coach and direct you to heal and create a new life."
? "Christina Rasmussen brilliantly carries the torch for all of those who have suffered loss. She has created the life reentry process that will help all people of all ages, and Second Firsts will be the guidebook for those who are ready to let go and choose life again."
? "In this moving book, Christina has drawn on both her personal and professional experience with grief to assist those who are suffering to find their way to a new ‘normal.’ In Second Firsts you will discover how to move from merely surviving to once again thriving." "Christina Rasmussen rode the roller coaster of exhaustion, hope, anxiety, and despair along with her husband throughout his battle with cancer. After he passed—just like everyone who loses a loved one—she faced the additional challenge of rebuilding her life. In Second Firsts, Christina does more than share her remarkable regenerative journey. She shows us why we must start living again and how to go about it. This engaging, touching, and helpful work is a must read for anyone facing or coping with the loss of someone close."
? "This powerful book guides us through five transformational stages that awaken the journey back to life after loss. The steps ignite the fire within every human soul who has experienced a death or a divorce. Every word is delivered with compassion and truth. Christina is certainly not afraid to tell you to move on if you have been stuck inside that Waiting Room of loss for far too long."
? "Christina gives people who are dealing with the physical and mental pain of grief hope for a sunnier tomorrow. I only wish Second Firsts was available to me sooner. This book will be on my night table forever." "Second Firsts is an important and powerful book! Christina Rasmussen not only beautifully inspires and empowers you to dream again after loss, but also gives you the tools to make those dreams come true." "Second Firsts is a practical guide for anyone who lost too much and forgot to get back to life. If that’s you, get this book and start living again."
? "Second Firsts will take you on a journey where you get to rediscover yourself no matter the loss or the heartache you have experienced. It will not ask you to wait for time to heal you, that’s for sure. Instead it will take you by the hand and lead you to a path of reentry with actions, steps, and tools." 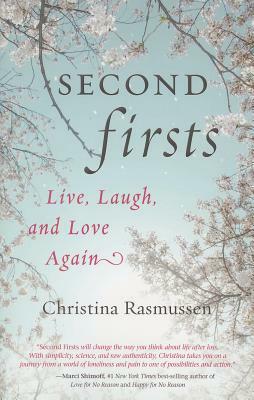 "Christina Rasmussen's Second Firsts offers sage practical advice to individuals—widowed or divorced—who need to begin life anew. Readers will find a book that, while sensitive to grief and loss, offers hope and a roadmap to finding meaning and purpose after life-changing loss." "Second Firsts walks into your life, grabs you by your courage, and gets you back on your feet. One day at a time. One action at a time. One new thought at a time. In the end you get to meet your new identity. Wow." "Seconds Firsts is an invaluable resource that not only inspires hope but also provides critical and practical information about healing for those who have lost so much. Christina’s vulnerability and willingness to reveal the ins and outs of her own transformation make it feel as though she is walking hand in hand with you on your way back to life after loss. This uniquely honest book?makes you truly believe that it is possible to connect again with life in a meaningful and rich way." "In Second Firsts, Christina Rasmussen has created the ultimate guidebook for navigating devastating loss, discovering the gifts of grief, and reentry into a passionate, vibrant, thriving life. Let Christina light your way out of despair as she reveals the unimaginable grace that awaits your life after loss."
? "If you have experienced loss in your life, Christina's book will quickly empower you to vibrantly refill, renegotiate, and embrace your broken-hearted spirit. Please, use your limited time and energy wisely and seize her Life Reentry program early in your grief. It will undoubtedly be a big victory for you and the universe. It’s a realistic, strategic, life-shifting, never-look-back program based on neuroscience and personal experience that leads you to feeling more genuinely alive than you ever thought possible." "Devastating, heartbreaking loss is part of every single life. Christina has been there herself, and in her book, Second Firsts, she takes your hand—offering comfort and step-by-step guidance to help you find your way back into the sunlight. This book will get you living and breathing again by showing you the way to a joyful, hopeful, and loving life."